But back in November of 2015 the same Chuck Schumer said that a halt of Syrian refugees may be necessary. Sen. Charles Schumer (N.Y.), the third ranking member of the Senate Democratic leadership, on Tuesday said it may be necessary to halt the resettlement of Syrian refugees in the United States. Republicans immediately seized on Schumer’s comment, which breaks with other Democrats who have argued against halting the program. 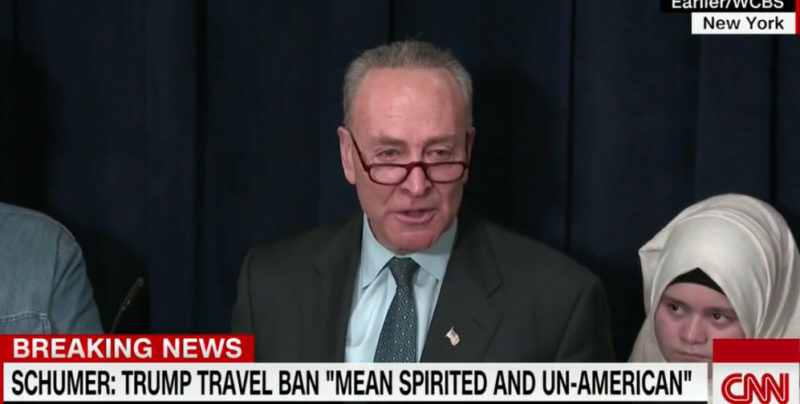 Schumer, however, declined to take the option off the table ahead of a special briefing scheduled for Wednesday afternoon on the process that is now used to vet refugees entering the United States. …A spokeswoman for Speaker Paul Ryan (R-Wis.) highlighted Schumer’s statement as an example of “bipartisan concern” over refugees. In summary, Chuck Schumer is playing the American people along with the mainstream media because it is now politically expedient for the Democratic party as it desperately tries to rebuild it’s party after losing over 1,000 seats nationwide to the Republicans. The White House’s Ultimatum: Get With Program Or They Can Go!